In Michel Faber’s novel, The Book of Strange New Things (Hogarth, 2014), a pastor travels far from home to minister to a population that knows little of Christian theology or practice, but is eager for the gospel. Peter, the earnest young missionary, feels God’s call but must leave his wife behind in the United Kingdom with email as their sole means of communication. His evangelizing and pastoral ministry is successful. He translates the Bible into another language and comes up with innovative explanations of biblical metaphors for a culture in which they are unfamiliar. Peter is also able to minister to the cynical and world-weary employees of the huge corporation that is bankrolling his trip. At the same time, however, his wife’s life becomes increasingly chaotic as she copes with weather emergencies, political turmoil, and the collapse of their home church. It is a novel about the difficulty of sustaining a marriage without physical co-presence, about sustaining faith in trying circumstances, about whether and how the Christian gospel of healing and resurrection can be translated into a deeply foreign context. This plot summary, however, leaves out an important element of the setting. Peter’s mission is to the alien species of another planet, and he embarks on his journey via spaceship. The distance between Peter and his wife, Beatrice (Bea), is not from one side of the world to the other but from one solar s ystem to another. When I first read a synopsis of The Book of Strange New Things, I assumed the novel would take a comical and cynical view of Peter, the Christian missionary. I thought the story would probably mock him and his faith, that it would be a meditation on the futility of trying to reach the transcendent or the inappropriateness of pressing one’s religious tradition on others. I thought it would be a gentler The Poisonwood Bible, with aliens. But this is not a novel that dismisses faith as irrelevant or outmoded. In fact, it is the sincere and earnest faith of Peter and Bea that gives this novel its complexity and sets it apart from other anxious fiction about marriages under stress. Peter is a thoughtful and intelligent Christian. 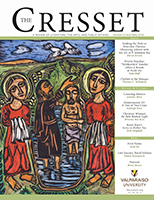 Early in the novel, an employee of the USIC corporation that has sent Peter to the planet Oasis shows her hostility to Peter’s evangelizing project, saying: “They’re not people.” Peter responds with an analysis of the etymologies of the words “person” and “creature”: “if we could just take it back to its Latin origins: creatura: ‘created thing.’ Because we’re all created things, aren’t we? But it’s suffered a bit of a decline, that word, through the centuries. 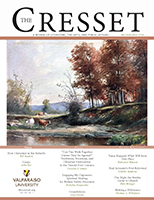 To the point where ‘creature,’ to most people means ‘monster,’ or at least ‘animal.’” Peter finishes by suggesting that it would be better to use the word “animal” since it has its origins in the Greek anima, “which means ‘breath’ or ‘soul.’” Peter’s interlocutor is taken aback and responds, “Well it’s plain to see you’re not an uneducated holy roller from Hicksville.” Indeed. And the novel makes it plain that Peter, whatever his faults (which become apparent), is a thoughtful and sincere believer. Bea, his wife, is perhaps even more admirable as she attempts to minister, not to exuberant aliens, but to people in a world of climate disaster, rioting, empty grocery-store shelves, and a general breakdown of law and order. Bea, a nurse, is compassionately caring for people in their church as the world falls apart around her. After relating several horrible incidents to Peter in an email, she writes: “Someone at work said to me this morning, ‘Where is God in all this?’ I didn’t rise to the bait. I can never understand why people ask that question. The real question for the bystanders of tragedy is ‘Where are WE in all this?’” Bea and Peter do not fit any stereotype. They are fully rounded characters with sincere faith that is understandably put under extreme stress by the events of the novel. The novel begins with Peter’s trip to Heathrow Airport and his goodbye to Bea before traveling to Florida to join the space flight sponsored by USIC. Although the novel contains the science-fictional elements of space travel and human life in an alien environment (and the necessary technology to make these things happen), it is only loosely connected to the genre. Readers get almost no details about “the jump,” a one-month journey for which humans are put into a comatose state. The planet Oasis—named by a child in Iowa through a contest—is similar enough to Earth to permit human habitation. The planet has abundant vegetation that can be processed to resemble almost any cuisine from Earth and a sultry humidity that almost becomes a character: “The air here was a presence, a presence so palpable that he was tempted to believe he could let himself fall and the air would simply catch him like a pillow.” The Oasan natives are roughly humanoid, except for their faces, which Peter thinks “resembled a placenta with two fetuses—maybe three-month old twins, hairless and blind—nestled head to head, knee to knee.” They have no features that Peter can identify other than a vertical cleft in the middle of their heads with which they speak. But despite the otherworldly landscape, non-human characters, spaceships, and a vaguely sinister corporation orchestrating it all, the novel is far more interested in what is going on inside Peter’s mind than in what is happening around him. Three questions propel the novel’s plot. Why are the aliens attracted to the Christian gospel? Will Peter and Bea’s marriage survive the stresses of the distance between them and the apocalyptic circumstances surrounding Bea? And what is the agenda of the corporation sending settlers to this distant planet? If this were a conventional science-fictional or post-apocalyptic novel, the third question would be answered by the end and the first two would be of comparatively little interest. In Faber’s novel, however, the first question drives the plot, and it is the only one that is answered. The novel provides a provocative answer to the question of why the Oasan aliens are drawn to the gospel message, an answer with profound implications for Peter’s understanding of his faith. The questions about Peter and Bea’s marriage, though, and about what is really going on with USIC are left largely unanswered. This choice to end the novel with these questions still pending struck me, at first, as unsatisfying. I was fascinated by Peter’s relationship with the natives of Oasis, and there is closure in understanding why they wanted so desperately the hope of the Christian message. But since the novel has an emotionally fraught and disintegrating marriage at its center, I wanted to know what happens to Peter and Bea. I am curious too about this futuristic world in which a mega-corporation owns a planet. But when I read the story of the novel’s construction I understood why this novel must leave its characters in limbo. Faber started writing The Book of Strange New Things just before his wife was diagnosed with a terminal cancer. He finished it, a few years later, just as she was dying. He claimed, last fall, in conversation with a writer for the New York Times, that it is the last novel he will ever write. Although the concept for the novel was birthed before his wife’s illness, it is not difficult to see a tribute to her in the final shape of the work. We cannot know whether Peter will ever be reunited with his Beatrice, so noble and unreachable, because this is a novel about sadness and loss and the ultimate distance between humans in death. But Bea does not die in the pages of the novel, and we don’t know if Peter will be able to return to her and help put their marriage back together. 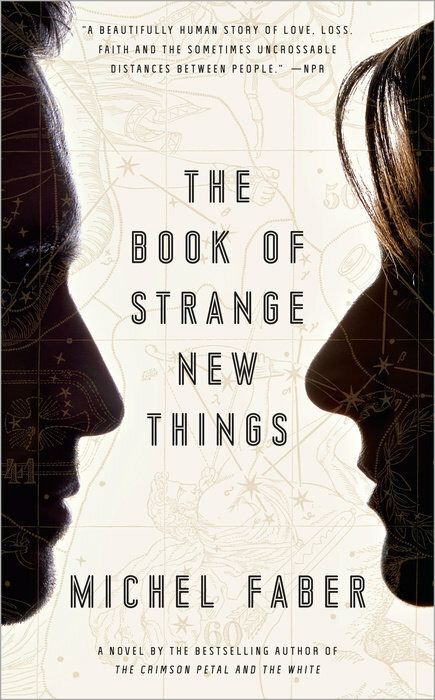 The Book of Strange New Things is a novel that asks a lot of questions about what it means to be human and what it means to have faith in something that transcends the material universe. The novel answers none of these questions. But it provides a fascinating story with dynamic and compelling characters that keeps its readers engaged until the last, inconclusive page. 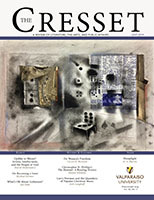 Susan Bruxvoort Lipscomb is Associate Professor of English and Chair of the Department of English and Writing at Houghton College.